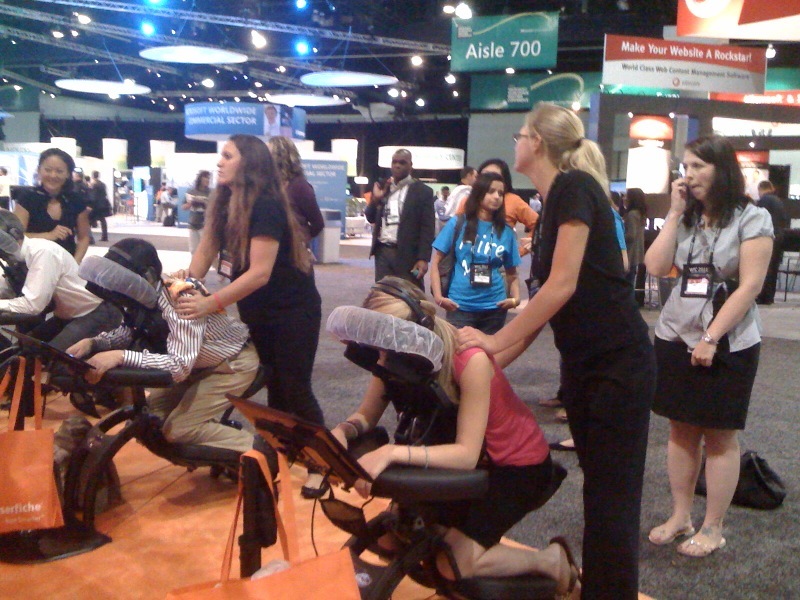 More companies today are using onsite seated massages as a tool to promote themselves through wellness at special events and beyond. Why? Because event massage services work. Relaxed people are more open to receiving your message then tense, rushed attendees. 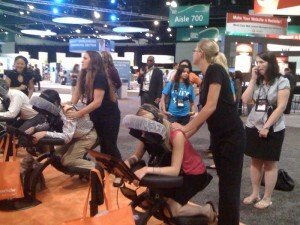 Trade show massage services translate into better business for you. Attendees remember you when you have a service like onsite massage. Chair Massage at work. With a relaxed and positive feeling, attendees will remember you and your product. Body Charge provides the highest degree of professionalism. In addition to locally licensed therapists, we are happy to provide an on-site manager at all of our events. Our corporate staff is on-call 24/7 for any assistance or guidance you may need. Above all, as the corporate source for seated chair massage therapy, we take the time to understand your goals and we’ll custom-fit your event to help you achieve them. We know that you are at a trade show to make sales, and to get as much exposure as possible. By providing us with a company look, we can blend in with your booth, and help you present the image you want to get across to potential clients. Trade Show Oooohs & Aaahhs from Krause Creative Group on Vimeo. Enhance your event massages with our reflexology services. Our professionally trained and certified reflexologists can put you more at ease by stimulating the release of endorphins on your reflex points throughout your body. Reflexology is great for alleviating tension and balancing your nervous system to treat things like stress, arthritis, back pain, and more. Learn about our reflexology services in New York City, Chicago, Nashville, Los Angeles, and more today by contacting us online! © Copyright 2019 Body Charge USA All Rights Reserved.